First version was made in Indonesia, second was made in China. There's some slight paint variations in the lip color, but it's very minor. My closest one didn't have much other than a single Maddy Hatter from the final EAH wave. I hope that Frankie/Alivia two pack hits near me. Customs / Re: Spectra/Invisi Billy....invisible? Billy is the same unless you get him from the Maul five-pack; then his body is made from blue-tinted transluscent plastic. And finally, thanks for the info about airbrushing - e.g., sanding joints before painting, using primer, applying sealer afterward. What are you using for sanding the joints? And are you using a respirator when air-brushing? What product(s) do you recommend for primer with acrylics? THANK YOU!! Thanks for all the love! I use either Testors sanding films or Tamiya sanding sponges. They have extremely fine grits and are reusable over and over again. They also work great with wet sanding, which gives a smoother finish and doesn't kick up dust like dry sanding does. I absolutely recommend wearing a respirator when airbrushing. The particles are very small, and if you're spraying anything that's not water-based, it's going to have solvents in it as well. For priming before painting, I usually use a krylon primer intended for plastics. I usually don't prime vinyl parts (like the heads) since the paint adheres very well and sometimes the vinyl will react with a spray paint and stay sticky forever. Thanks! I do think they would have tried to slide Gilda in to a multi-pack, or maybe into an SDCC exclusive if the line hadn't started winding down and gotten rebooted. Of the backgrounders, she was one of the most prominent ones. Thanks! I agree that, once I had all three of them as dolls, I appreciated Gory and Quill a lot more. I still think that fans made the right choice to have Finnegan get made. He's just so unique that it's amazing a doll that's male, disabled, and a completely new mold got manufactured. I still wish the other two had found a way to make it to production, though. Quill's recipe: She's made from the Harpie CAM head and lower legs, and her lower arms and wings from Avea Trotter. It's not so obvious in pictures, but she's actually pretty neon yellow in person - I figured that as a bird person, she is more related to parakeets and parrots than any sort of bird of prey, so she's the same color as a tennis ball, just like those cute pet parakeets. Monster Discussion / Re: Will there be a SDCC release this year? Wow, thanks for the praise! Quill is still in-progress, but I hope to have an update for her soon. Customs / Re: Can I bring in my MSC-sprayed head to cure once it's dry? I do this, and the odor isn't too bad once the initial drying has happened. Seth is done! First pictures under the spoiler cut. I hope to take some better ones soon. I would like to make a Bram, but he's lower on my to-do list than a few characters. I should be finishing Quill next, and I'm making progress on Seth Ptolemy as well. Seth's shoes had to be redone and there were a couple other setbacks, but I should be done with both of them in June. Sure! Alivia is a work in progress, I’m working on eventually making her look more like her animated self. In these pics you can see I’ve been touching up Gigawatt and doing her stitches. I need to print out/sew her jumpsuit, but it will be after I’m done with Quill and Pharoah. If you keep your eyes peeled, she’s been on eBay, as has her predecessor, That pink-haired Candy doll. Here are some more Gory and Raythe pics! Thanks! 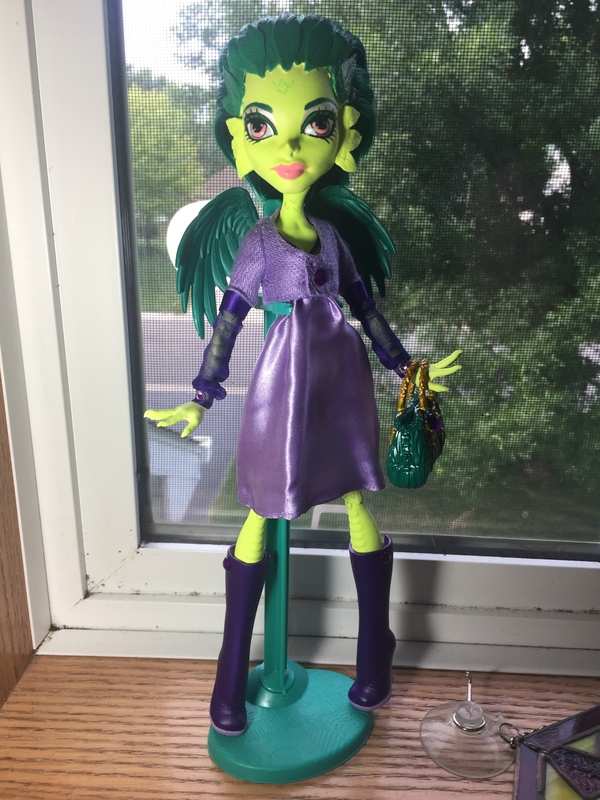 I was going to make Gory later, then I discovered that the Reboot Signature Draculaura's earrings are essentially identical to the ones Gory is supposed to have, and it just got me on a whole quest to finish Gory up. I even gave her a pet from the reboot pet line, because I felt like it fits her personality so well. His name is Garlick the vampoodle. I have some updates for you all! I've finished Raythe and Gory Fangtell. Here are a couple of pictures, and I'll add more pictures of Gory tonight. I'm also working on my revamped Intergalactic Gala Supergirl. She's been rerooted and her outfit is partially done. I'm still working on her cape. Also, here is an early sneak peak at the progress on Quill Talyntino, who should be getting her body painted later this week. I'm about halfway done with her at this point. The person/people who worked on these for you did a very good job!